Heat oven to 375°F. In large bowl, stir cookie mix, oil, water and egg until soft dough forms. Shape dough into 1-inch balls. On ungreased cookie sheets, place balls 2 inches apart. Do not flatten. Bake 8 to 9 minutes or until edges are light golden brown. Cool 2 minutes; remove from cookie sheets to cooling racks. Cool completely, about 15 minutes. In small microwaveable bowl, microwave chocolate chips, butter and peanut butter uncovered on High 1 minute to 1 minute 30 seconds; stir until smooth. Stir in vanilla. Place 1 1/2 cups powdered sugar in 1-gallon resealable food-storage plastic bag; set aside. Place 12 cooled cookies in large bowl. Pour one-third of chocolate mixture over cookies in bowl. Using rubber spatula, toss cookies gently to coat. 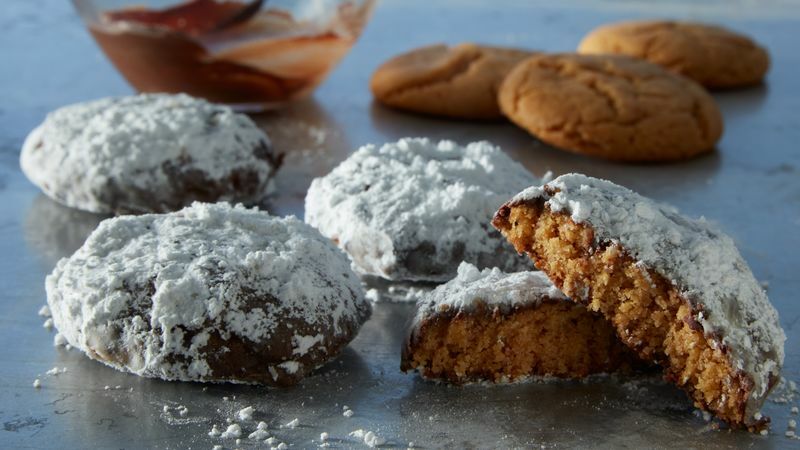 Place 3 cookies at a time in bag with powdered sugar; seal bag. Gently turn bag to coat cookies. Remove cookies from bag to cooling rack to set. Repeat with 12 more cookies and half of remaining chocolate mixture, rewarming if needed; repeat again until all cookies are coated, adding additional powdered sugar to bag as needed. If using 21-oz pouch of Betty Crocker™ peanut butter cookie mix; use 2 tablespoons vegetable oil, 2 tablespoons water, and 1 egg. Shape into 42 balls. For Coating; 1 1/4 cups semisweet chocolate chips, 1/3 cup butter or margarine, 1/3 cup peanut butter, 1 1/4 teaspoons vanilla. Place 14 cooled cookies in large bowl, pour 1/3 of chocolate mixture. Repeat with 14 more cookies and 1/2 chocolate mixture. Repeat with remaining 14 cookies and chocolate mixture. Makes 42 cookies. "These treats are a bigger and better version of one of my favorite comfort foods, puppy chow." Make it "cookie night" with the family. Everyone can take part in this cookie from forming the balls to shaking them in the bag with powdered sugar.